It’s inevitable that virtual reality will be the next biggest thing in terms of online gambling. Already, it’s utilised in medical training, military training, and for entertainment reasons all across the world. One of the main disadvantages of virtual reality at the moment is the fact that it costs an awful lot of money to play. For example, a pair of Oculus Rift goggles will cost you as much as $800, while the price of computer powerful enough to run the software is around $1500. This is the reason that most gamers stick to online gaming sites such as Supreme Play – 2018 – which is one of the most up-to-date casinos in terms of software and games, plus some titles are even free to play. However, it’s been estimated that the overall cost of virtual reality will decrease in the near future, meaning more gamers will be able to access it. But what impact will this have on gambling websites? This article will discuss the future of online gaming. How Will Online Casinos Cope? There are thousands of online casinos worldwide that offer gamers the chance to play a huge variety of titles. Virtual reality games have, so far, only managed to make its way onto several. Whilst it remains pretty uncommon to be playing virtual reality titles, even if your money allows, what will happen once it becomes more popular? One of the biggest disadvantages of online gaming is the fact you can’t interact with fellow gamers. It can be a lonely game at times, and unless you’ve got somebody else in the room with you, it’s just yourself and the computer. Yes, there are live dealers games that enable you to talk via chat to dealers and players, but it’s still pretty restricted, and, after all, you’re still just communicating with text and nothing else. Virtual gaming aims on opening up a completely new dimension in terms of interaction. Now, you will be able to walk into a casino and sit next to whoever you want to, enabling you to make friends, and even meet up with them on a regular occasion. 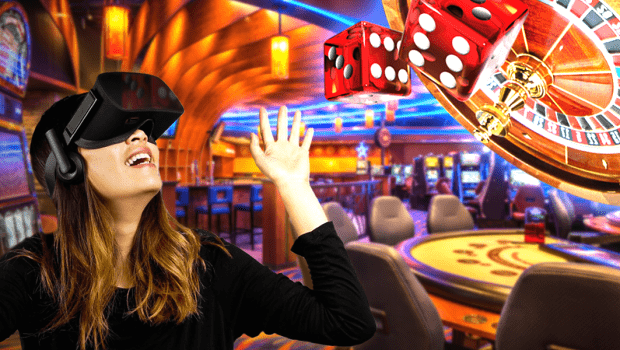 Once virtual reality becomes more popular, you may find that land-based casinos struggle to reach the same number of visitors as they do now. Gamers will be able to enjoy the benefits of a real casino from the comfort of their own home, and there are many reasons why it’s convenient. First of all, there are no environmental factors that may distract you from gaming, such as cigarette smoke, customer behaviour, and strange smells, for example. You also won’t have to tip the dealer which is great for your bankroll. Furthermore, it’s been suggested that you can select your own music for inside the casino. This is a wonderful idea, and it will attract players who prefer listening to what they want to whilst spinning the reels. Will There Be an Impact on Online Poker? Poker rooms online will be affected differently to online casinos. The latter does not involve any other players, while the former can only be played with fellow gamers. This means that virtual reality in the future will give you the chance to play poker online with the opportunity to actually see your opponents, and also their emotions. Plus, it gives you the chance to stop and start your poker game whenever you wish, allowing you more freedom. You may even be able to do things that are forbidden in a land-based casino, such as expressing your anger more openly or acting in a way you probably wouldn’t in real life. It seems that online poker will only grow in popularity, which is quite the opposite of the effect on online casinos. There are many more reasons to play virtual reality poker, and it may actually excite players who wish to experience the cutting edge technology that land-based poker environments won’t be able to offer. You may not realise that virtual reality gambling is here to stay, but rest assured, it will be everywhere within the next few years. Even though it has already made an impact on other industries, gambling is an area where it looks like the most difference will be made. With the advantages outweighing the disadvantages, and the cost of virtual reality on the decline, don’t be surprised to see virtual reality becoming extremely popular in the future. If the casino can get past this finance hurdle which is a problem for a lot of gamers, it will be huge. With that said, nothing will quite compare to the reality of dressing up, meeting friends, and having a drink in a land-based casino, but the potential impact of virtual reality on the industry shouldn’t be dismissed.